What’s hoppin’ at the Hansens? Pogo loves to do laps around the house. 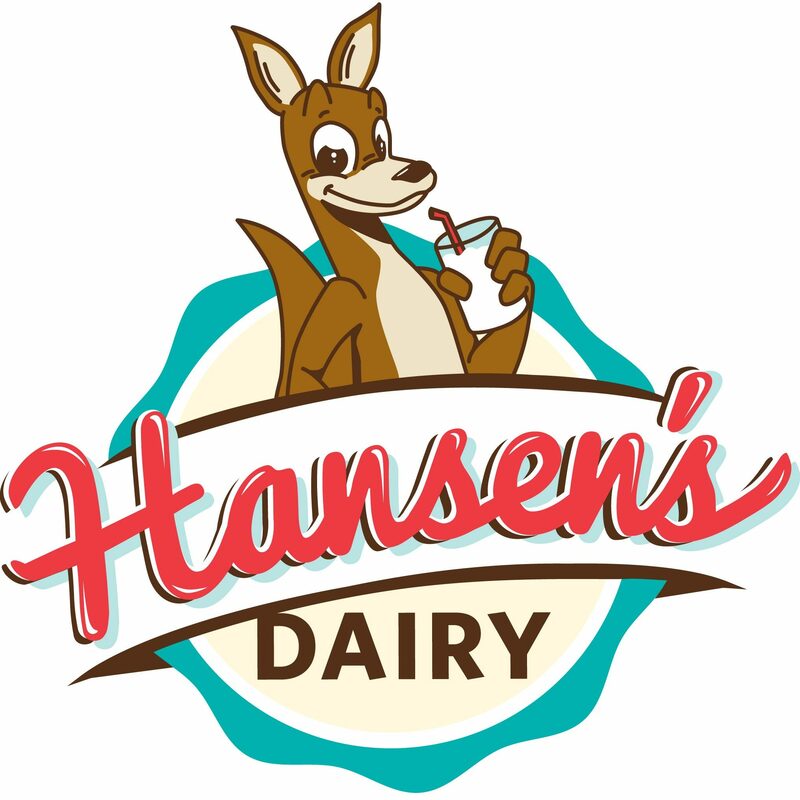 You know we have a wallaby in the Hansen’s Farm Fresh Dairy logo. My husband, herd manager Blake Hansen, fell in love with wallabies (miniature kangaroos) after visiting Australia and seeing them in the wild. He acquired three of them from an exotic animal dealer in 2002 and we decided to use them as the logo for our milk. It was something different and meant to attract the attention of kids — whom, of course, we want to consume more dairy products. We just make sure people know the milk comes from the cows, not the wallabies! They’ve been quite the tourist attraction over the years. Pogo and Tootsie eat in front of the mural in our kitchen that includes wallabies. This year, Blake decided he wanted to raise some kangaroos, so we bought two female babies from a dealer in Texas. They flew into Cedar Rapids in early December, and now they are living in our house. Pogo is about 8 months old and Tootsie is 6 months. They both weigh less than 10 pounds and are about 18 inches tall. 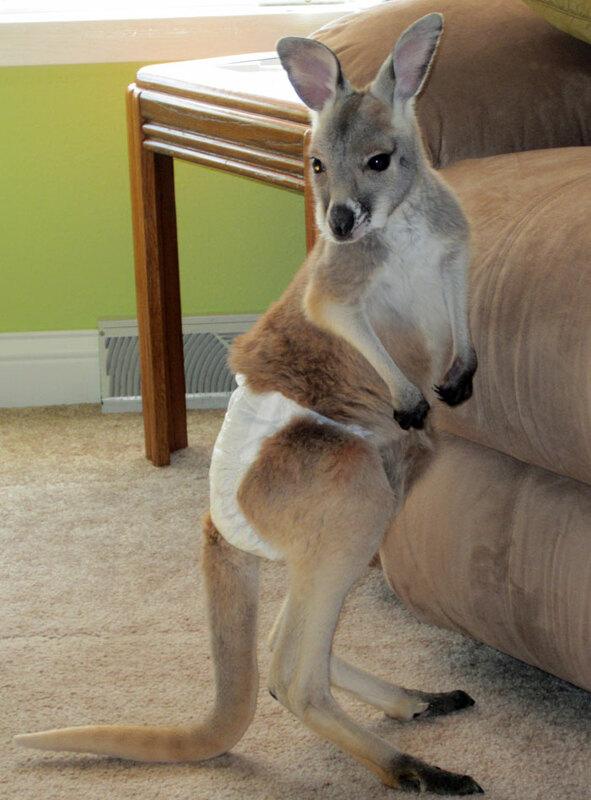 What’s it like to live with kangaroos? For right now they spend a lot of time in warm little bags that simulate their mother’s pouch. 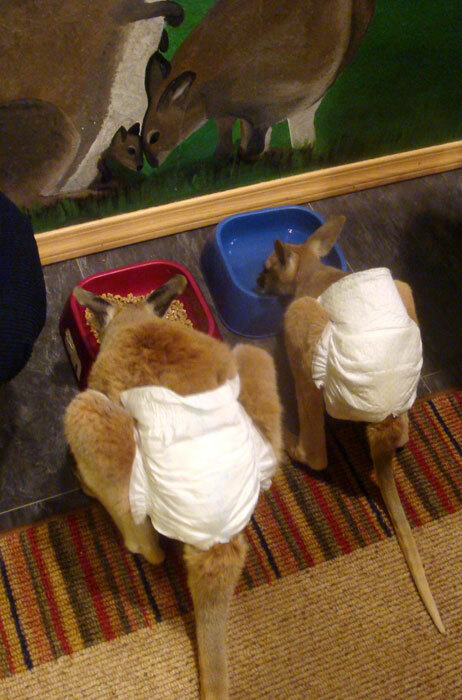 They are fed a kangaroo milk replacer four times a day by bottle and eat some solid pellet food called Happy Hopper. Blake puts diapers on them, cutting a slit for their tail. They love to do laps around the house, and they are fast, jumping effortlessly over any obstacle. As I write, Pogo is jumping over the Monopoly game Blake and some of his nieces are playing! 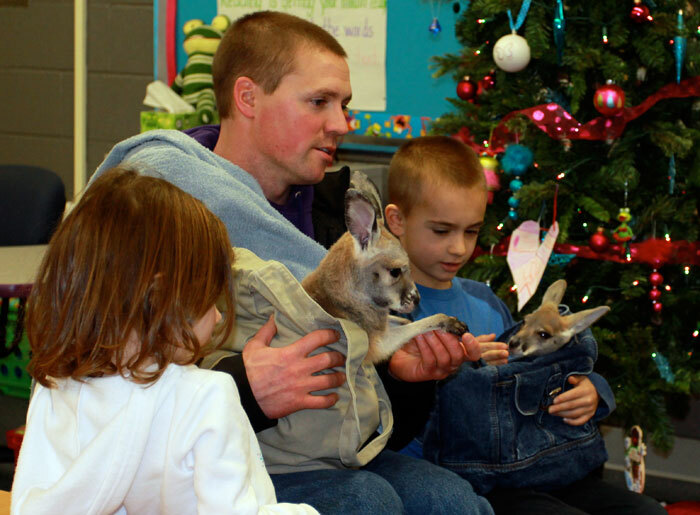 Reese, Blake and Brady Hansen share the kangaroos with Brady’s class. Recently Blake and his brother Brad took Pogo and Tootsie to Hudson Elementary School. The ‘roos brought a lot of smiles to the students’ faces. 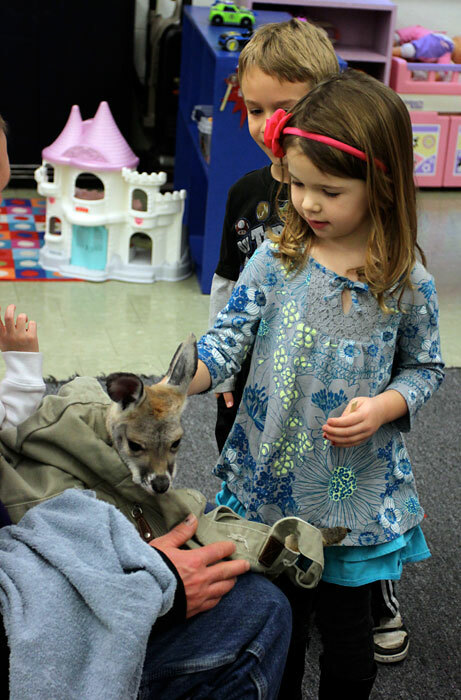 Hudson Elementary students were quite surprised when the kangaroos showed up in their classrooms. 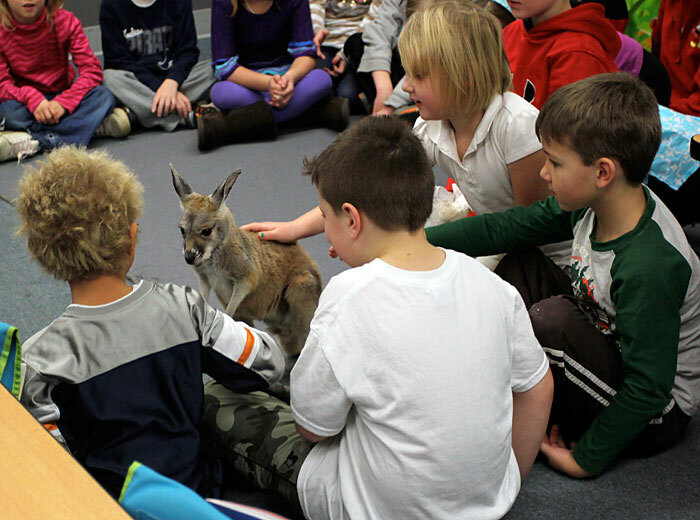 Bridget Hansen pets Pogo in her preschool classroom. Hopefully the kangaroos made an impression on the kids and they equate that experience with drinking Hansen’s milk. But these kangaroos aren’t drinking our milk. The irony? Marsupials are lactose-intolerant. I don’t think Blake knew that when he picked them for the faces of Hansen’s Dairy!